A cervical selective nerve root block is a type of epidural steroid injection for treating neck, upper back, shoulder, and arm pain. The dura is a protective covering of the spinal cord and its nerves. The space surrounding the dura is called the epidural space. In the neck it is called the cervical epidural space. 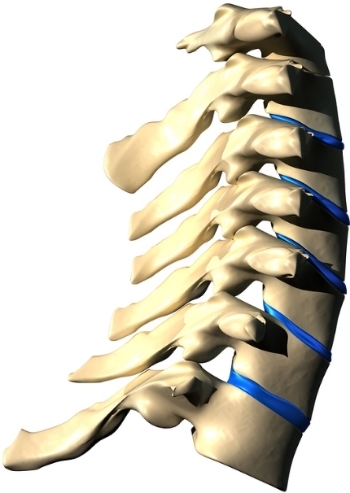 The cervical area of the spine has seven bones, called vertebrae. Soft discs found between these vertebrae cushion them, hold them together, and control motion. If a disc tears, chemicals inside may leak out. This can inflame nerve roots or the dura and cause pain. A large disc tear may cause a disc to bulge, inflaming nerve roots or the dura and cause pain. If you have pain in your neck or upper back when you move your head, you may have cervical disc and dural inflammation. If pain travels to your arm when you move your head, you may have nerve root inflammation. Common tests such as MRIs can show disc bulges and nerve root compression, but may not show a torn and leaking disc. A cervical epidural injection can help to determine if disc problems, dural, or nerve root inflammation are causing your pain. In a cervical epidural steroid injection an anesthetic and a steroid are injected into the epidural space to reduce inflammation. If the needle is positioned next to an individual nerve root, it is called a selective nerve root block. It puts medication directly along an inflamed nerve root. Before your injection, you will be asked to sign consent forms, list medications you are taking, and list any allergies to medications. Procedure may last 15-30 minutes followed by a recovery period. Patients remain awake for these procedures. Sedatives can be given to help lessen anxiety. The patient will be lying face down on the table, will receive a local anesthetic, which will numb the skin before the injection is given. If IV sedation is used, your blood pressure, heart rate and breathing will be monitored during the procedure. With the aid of a fluoroscope (a special X-ray), the doctor will direct a hollow needle through the skin and muscles of your neck into the individual opening where specific nerve root(s) come out. Fluoroscopy allows the doctor to watch the needle in real-time on the fluoroscope monitor to make sure that the needle goes into correct location. Contrast agent is injected into the epidural space to confirm correct needle position and desired medication spread along the targeted nerve roots. Some discomfort may occur, but patients typically feel more pressure than pain. After the needles are confirmed to be in correct position, the doctor will inject mixture of local anesthetic and corticosteroid medication next to inflammed nerve root(s). The needle is then removed.